The 35 X 20 Fill log cabin is an impressive holiday log home design that feels open and spacious with high ceilings, natural light and clean lines. It is easy to imagine the Fill log cabin as a two-bedroom style bungalow, providing an exquisite space to enjoy life. With endless options the Fill log cabin is a 35 x 20 blank canvas for you to personalize to perfection. Place it in a favorite spot for that fabulous feeling of home and the ultimate in stress-free living. 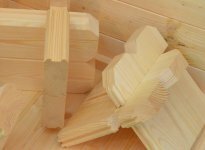 Attractive and durable Scandinavian spruce is used for the entire Fill log cabin for the highest quality. The floor bearers are heavy-duty and pressure tested for the ultimate in stability. Our double-glazed wooden windows come standard, yet upgrading to German-quality WinkHaus PVC is easy. With a reinforced roof, thick walls, and our 10-year anti-rot guarantee, you can buy with confidence. External dimensions (width x depth) 34'6" x 19'6"
Internal dimensions (width x depth) 33'9" x 18'11"
Minimum base required 34'1" x 19'2"